For each clue, including trailing remarks such as "(2 words)", remove all numbers, spaces and punctuation. Color in the grid the cells with letters in the corresponding answers that match the letter(s) at the heart of the clue. The result will be a set of symbols that represent something that person is associated with. If you're observant, you might notice one symbol was missing. Look for a straightened version of it near the heart of the crossword to get another adjective that could be used to describe this person. If you want to see who the person is, you can obtain some useful information by reading the first letters of every clue for which at least one letter was marked. A few clues near the heart of the crossword should help disambiguate some details. Come back here with the three pieces and the identity of the person for your green tick! 1. _____ Beat Agents, English version of rhythm game Osu! Tatakae! Ouendan! 34. A character nickname in the Chunsoft visual novel "999: Nine Hours, Nine Persons, Nine Doors"
113. Audio rendition of letter "H"
10. The number that would correspond to L in a system of numbering that skips over letters that specify colors? 11. A color you might use when no other is specified? 87. Synonym of the word for the color one might indicate by the letter A? 108. If you fight this creature in Pokémon Puzzle League's story mode, you will be listening to "Everything Changes"
111. Little playable character in "Goof Troop"
124. Synonym of the word for the color one might indicate for the letter E? If you need to read something off of the grid, it will be in reading order (rows from left to right, then columns from top to bottom). That goes for all 3 bullet points. Someone is probably going to make one anyway, so if it helps here's a spreadsheet with the grid. Please let me know if you find any inaccuracies and I'll correct them. 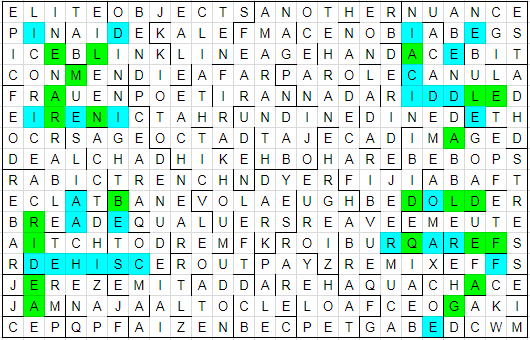 Erratum: For 130-across, only the cell corresponding to the second letter should be colored. This puzzle was co-solved with Sp3000 (who did a large part of the work). As the instructions say, strip everything but letters from each clue. 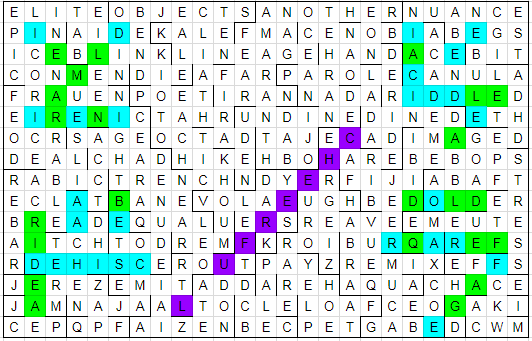 Then, whenever an answer contains the middle letter of a clue (or one of the middle letters, if the clue length is even), highlight it in the grid. 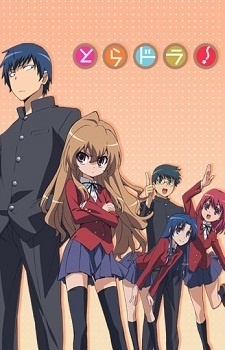 These are the characters from the logo of TORADORA (a romantic comedy light novel series that was adapted into an anime). The exclamation point from the logo is missing. But we can find it in the grid! This spells out the adjective, CHEERFUL. 10. (TEN) The number that would correspond to L in a system of numbering that skips over letters that specify colors? 11. (AMARANTH) A color you might use when no other is specified? 87. (DARK) Synonym of the word for the color one might indicate by the letter A? 124. (PALE) Synonym of the word for the color one might indicate for the letter E? - Read off the orange cells (in standard reading order). - Interpret the numbers as "runs" of a specific color, a la Run-length encoding. E means white, A means black, and no letter means amaranth. For instance, the first few orange letters are EIEBJET. This gets read as [EI][EB][J][ET], meaning "7 white cells, then 1 white cell, then 8 amaranth cells, then 18 white cells". - Arrange the given cells into a square by columns. 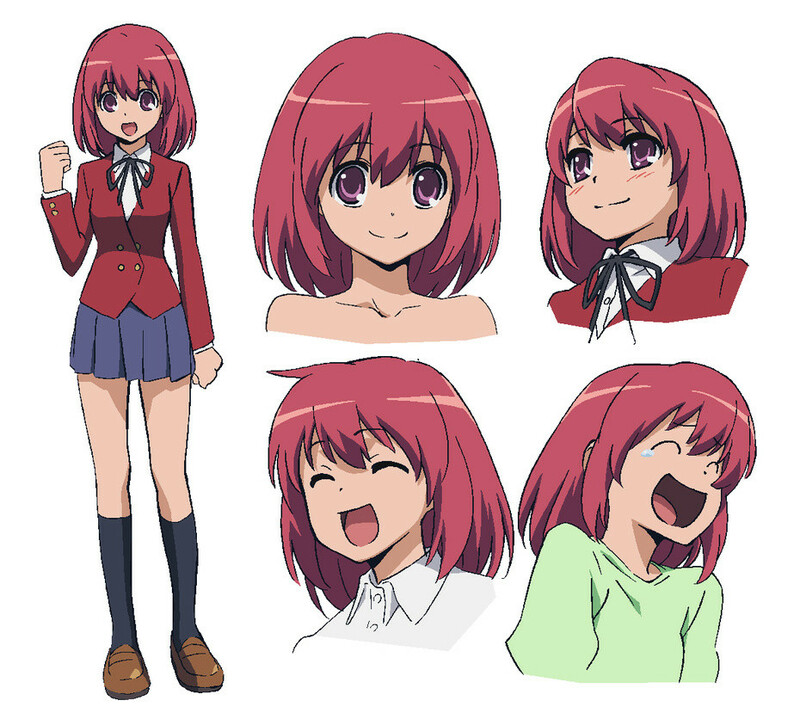 This is pixelart of MINORI KUSHIEDA, a character from Toradora and the subject of the crossword. Wrap-up: The Making Of "A Racing Heart!" This puzzle's idea has a long story. 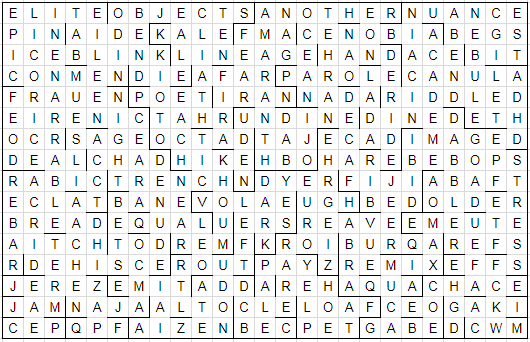 I've been meaning to have an image be hidden in a crossword for almost a year now (more specifically, since the steganography topic challenge), but I didn't find any good ways to make it work at the time. I settled for hiding words in a colored image in Help! Can you get my puzzle back?, and put the original idea at the back of my mind. More recently, while solving Creatures of Darkness, Sp3000 said he expected something "close to heart", which made me want to do something with such a theme (an indirect thank you for the inspiration was given by adding a clue mentioning him in the puzzle.). Anime characters also can be drawn with simple lines, which is something I needed since I couldn't use any fancy compression scheme (I needed to explain it after all!) The choice of character was a no-brainer for me, and the general theme was modified to "hearty" after I noticed that it could mean both cheerful and athletic (the last one a bad pun for run-length encoding). 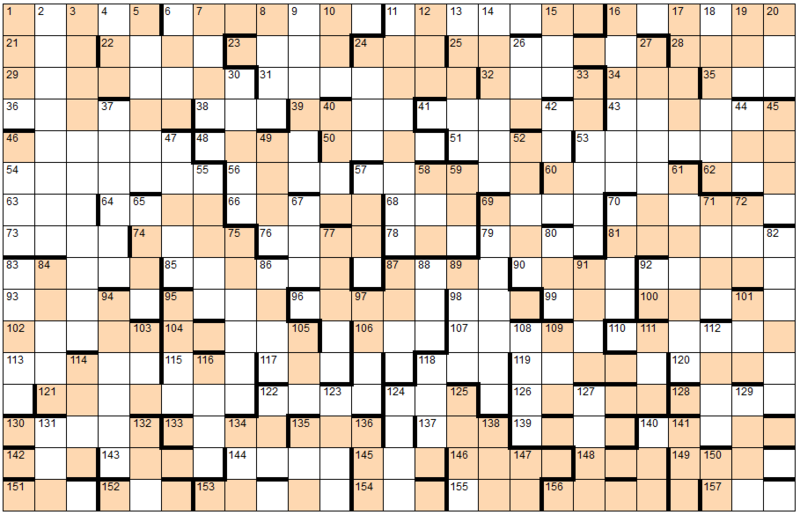 An issue is that a single drawing of an anime character would not be very specific, so I took a cue from Ucaoimhu's crosswords (for instance) and included other info in the crossword as well. I hoped making the image would be easier, but I did not find a tool to reduce an image to 3 colors automatically (the closest I got was Gimp's posterize, but it always uses at least 4: magenta, cyan, yellow, and black). So I just did it the old fashioned way and drew manually on top of this image, using white, black and amaranth (I had to ask a friend for the name of this color), then constantly tried to reduce the number of color switches to help out my run-length encoding (it started out at ~260 letters or so, and it got down to 181 before I saw no other obvious changes). Minorin, in all of her self-improvement wisdom, would like to remind you that you shouldn't get so caught up in searching for what you can't see, that you lose sight of what you can. 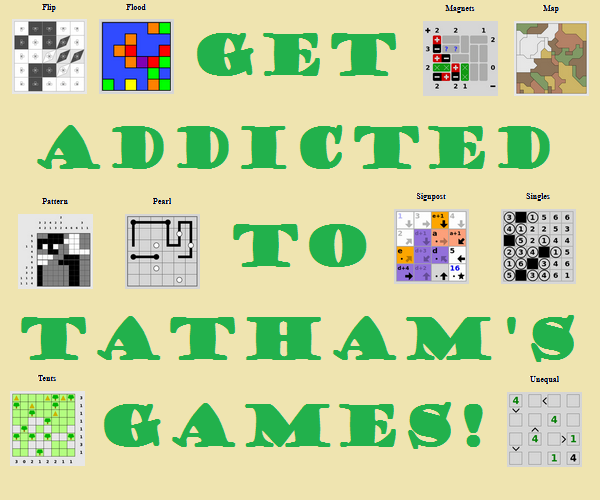 I hope this was fun, or at least as interesting to solve as it was for me to make! Not the answer you're looking for? Browse other questions tagged knowledge computer-puzzle crosswords or ask your own question. Help! Can you get my puzzle back? What are the conventions telegraphing when answers are abbreviated in New York Times crosswords?